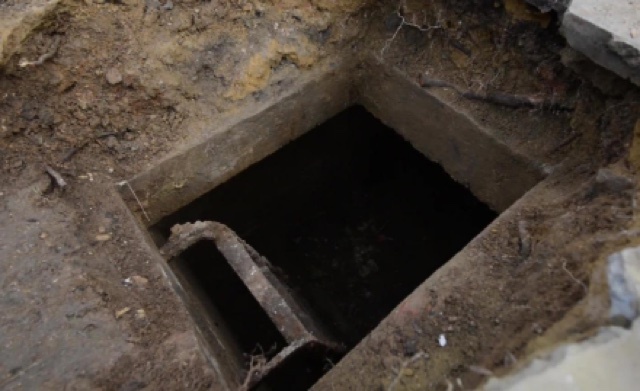 A man was shocked to find a complete WW2 air raid shelter underneath his front drive. Simon Marks, 37, thought he had driven onto a flowerbed when the wheel of his black Vauxhall Zafira got stuck in a hole outside his home. But when he got out he found that part of the driveway of his £400,000 four-bed detached house had caved in. He looked closer and realised a two-roomed shelter was lying under the driveway of the property in Luton, Bedfordshire. He explained: "So I had my car parked on the front driveway, and I went to reverse out. As I did, I heard a crumbling noise under the front tyre. I thought that was a bit weird but I carried on reversing out, and as I did the car jolted forward and I got some real resistance. So I put my foot down and reversed out, then got out of the car and checked, and this hole had just opened up in the front garden. "After moving some of the slabs out of the way and investigating, we actually found the top of a ladder. After dropping down a selfie stick with a camera on, we actually found it was an air raid shelter." He added: "The actual shelter itself is 10ft down. It was completely filled up with mud, but we managed to dig it down to around 5ft. It's pretty massive." Simon plans to dig out the rest and reveal the full 10ft of the shelter. It puts a new spin on the ultimate 'man cave'.